Products from manufacturers who can demonstrate a credible commitment to manufacturing and distribution in an environmentally sustainable and responsible fashion (the ‘sustainability story’). Products which themselves are sustainable in use. Products bearing recognised green accreditation. No wonder that there is a considerable amount of misunderstanding about whether a cleaning, hygiene or catering product can be truly regarded as ‘environmental friendly’, given that all manufacturers will claim that their products are ‘green’ in one way or another. The question to be asked is if any product without one of the major green certifications can ever genuinely lay claim to being ‘green’? Yet by virtue of their nature, some products fall outside the usual criteria by which they can achieve a green certification, although on all other sustainability criteria, they can probably be regarded as ‘green’. Many concentrated cleaning chemicals fall into this category for example. Environmental sustainability can broadly be defined as meeting current needs without compromising the ability of future generations to meet their own needs. The general concept of improving sustainability is simple: reduce consumption (to preserve the world’s natural resources) and reduce emissions (to minimise pollution). 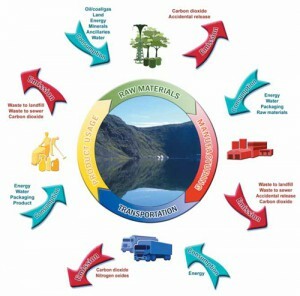 Consumption and emissions will occur during a product’s manufacture, transportation, use and disposal. In many cases, consumption and emissions are linked, so reducing consumption in one area will bring benefits in other areas. The sustainability concept is very simply illustrated by the following chart (reproduced from the UK Cleaning Products Industry Association website). As part of our evaluation as to whether or not to stock products from a particular manufacturer, we will evaluate their green credentials from publicly available documentation, such as websites and environmental policy statements. We have even taken this one step further by attempting to document the ‘sustainability story’ for every product we supply, essentially a full ‘cradle to grave’ examination of how the product began life as a set of raw materials and the final stage of distribution into one of our warehouses. Completed stories are stored with our product catalogue, which is available to registered users of My Cherwell Online. Read an example sustainability story for Katrin Basic 1 Ply Natural Zig Zag Hand Towel (3620). We believe that sustainability is not just about protecting the environment for future generations (although this is a good thing to do), but also about reducing costs, which we can pass onto you in lower product prices. We have implemented the Carbon Smart Certification Programme, as one key driver of cost reduction, with a particular focus on energy saving, recycling and water management. In addition, our 14001 environmanagment programme promotes the use of suppliers who themselves operate in a sustainable fashion (such as reducing the amount of outer packaging on products) and we encourage our customers to use products (such as chemical concentrates), which effectively combine the principles of good ‘cost in use’ and sustainability. Our environmental policy statement describes the broad principles that we apply to environmental management. 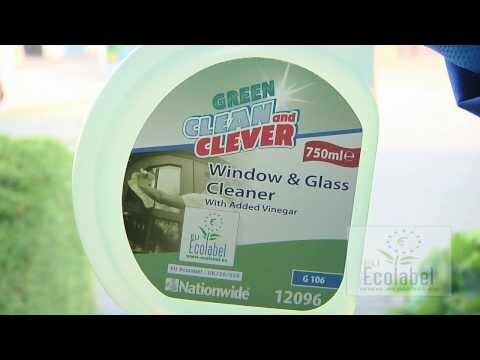 Although all our products are selected from suppliers who can demonstrate a commitment to manufacturing in an environmentally sustainable manner, we have also assembled a range of green products for customers seeking products which are explicitly certified as environmentally friendly and sustainable in use.